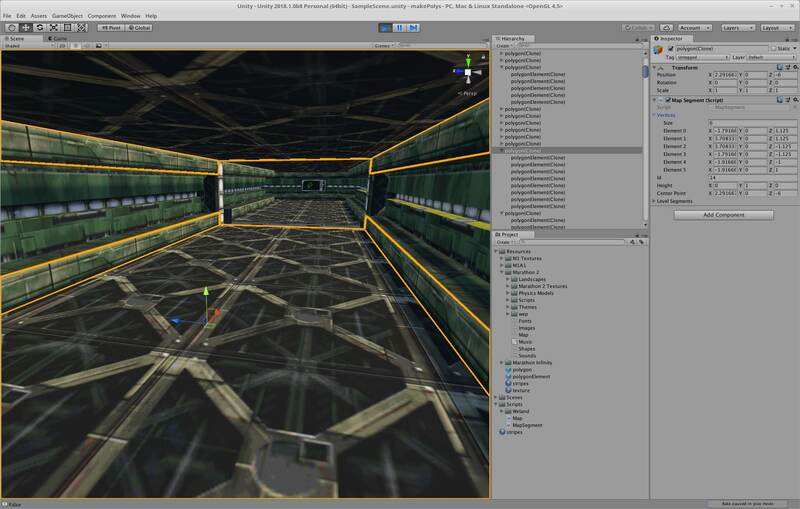 I am creating a port of Marathon to the Unity game engine. 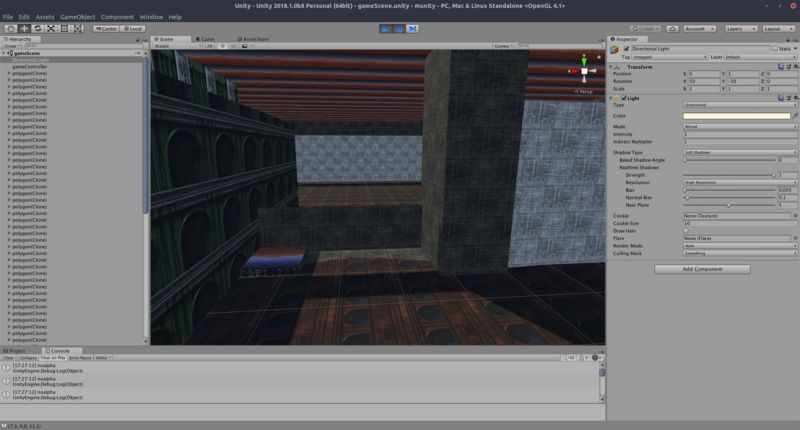 Currently i have the level geometry rendering correctly, and the basic platforms/doors working. Mostly this is thanks to the fact that i can use large chunks of the Weland source code to decode the Maps and Shapes files. What i need now is a way to read the sound and physics files. So - Is there anyone here who knows what the data format is for those? Or is there somewhere where its been documented that google doesn't know about? You may wish to try the source code for Shapefusion. It is an editor capable of modifying physics files. As far as what the physics actually mean. You can view this link for a high-level understanding of some of the properties. I'm surprised you're able to get the Unity engine to render 5D space. I'd love to see how that works. I'm happy to answer questions about the file formats. Thanks Zott, i can see where Shapefusion is opening files, that looks to be just what i need to get started, especially with that description you linked. As for Impossible space, at the moment it just makes a mess, however the way Im assembling the world is that its being made from a whole bunch of gameObjects, each one containing the meshes needed to draw one marathon polygon. The plan is to just not draw the gameobjects for the polygons that the player shouldn't be able to see. These show how the level is built. Question: Will this port include jumping? I just wanna jump, man. I'd love to contribute to this project. I think it's a way better use of time than trying to shoehorn stuff like modern lighting and multiplayer into Aleph One. Jumping already is a thing in the engine though? Ever heard of grenade jumping? Get good! I mean, just think about it, how high can you jump in real life? Most people can't jump very high (well, I can't). Admittedly, you are a battleroid and not a me (don't try being a me, that's not very interesting). But you also have to consider the marine is wearing battle armor, something that doesn't sound particularly lightweight. Combined with the added weight of the battleroid's titanium bones and other such things it is reasonable to assume that the battleroid can't jump much higher than I can. And that kind of wimpy jump wouldn't be fun to use in the video game. Just think about normal security officer duties. Jumping might be required in a military situation, but it's been a long time since you have done that if you have at all. Security officers probably don't encounter the kind of obstructions that military personnel do. While you get lots of practice running in battle armor as a security officer (presumably), you also presumably get much less practice jumping. With this in mind, it is very believable that you have the strength to run fast in battle armor but not jump high (because you can already "jump" horizontally pretty well as is in the engine). As for the idea of porting Marathon (hopefully all of Aleph One so all of the scenarios work) to Unity, I love it. I don't have much experience in this community but one thing that has impressed me with this community is the ability to make small, useless changes over long periods of time. Actually getting Aleph One 1.3 out the door? No way! Making some textures into HD? Sure, that's not too hard, we can do that! Just look at how many things are on simplici7y ever since work on 1.3 started. So if the engine is in place for nice lighting and maybe even, gasp, true 3D monsters instead of cardboard cutouts sort of thing, it really is conceivable that the game wouldn't look quite as primitive in, say, a decade. CluckyInventor wrote: Just think about normal security officer duties. Jumping might be required in a military situation, but it's been a long time since you have done that if you have at all. Security officers probably don't encounter the kind of obstructions that military personnel do. While you get lots of practice running in battle armor as a security officer (presumably), you also presumably get much less practice jumping. With this in mind, it is very believable that you have the strength to run fast in battle armor but not jump high (because you can already "jump" horizontally pretty well as is in the engine). So we aren't playing a soldier, we're playing a trigger-happy mall cop. Love it. No offense to any genuine security officers out there, I'm in that line of work myself. Even though I was mostly joking, I was still genuinely curious about the physics. Marathon has very unique physics that I have not personally seen in any other game. I remember a few people discussing Marathon's "floatiness" and trying to replicate it in Doom but couldn't get it working right. I don't have any Unity experience. I have a lot of Marathon experience. So if you can think of a way that's helpful (within the limits of my very limited free time), let me know. For jumping, why not just use the jumping lua from Simplici7y? but only allows one iteration. which can be extracted, that allows multiple iterations. Both of these use the mic key. If anyone is interested in helping out there, let me know. 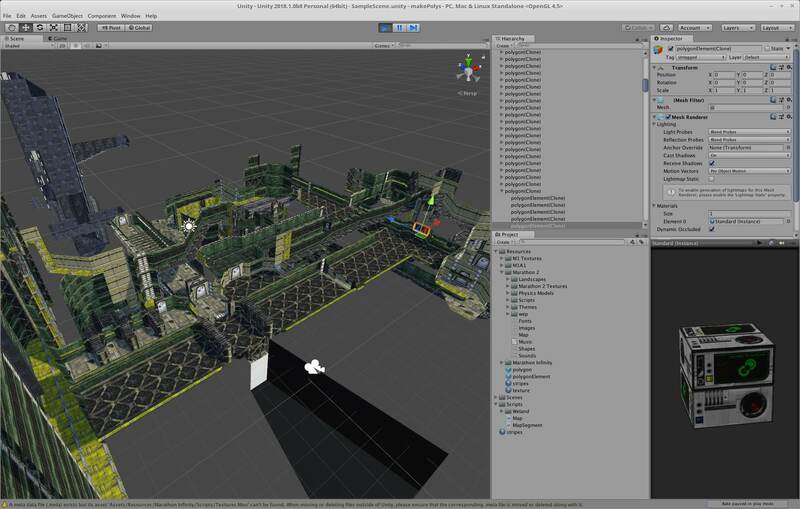 Just downloaded this and loaded up in Unity. Selected the Marathon Infinity data files but when I hit "Go" I get "Display 1 No cameras rendering" on the screen and the following error in the console. Hmm. It sounds like it’s trying to draw a texture that isn’t in the shapes file. The no camera will be because it didn’t spawn the player.which would be because it didn’t finish building the world. If you switch to the scene camera in the editor, did it manage to draw anything? If not, can you check that it’s the correct shapes? Apparently the bug is in the menu/file chooser. For some reasons if I for example choose a physics file in the Physics box it will both populate the physics box and shapes box menu item with the physics model path. This was causing the above error as it was trying to read the physics model as a shapes file in my case. I am unable to determine under what circumstances this happens, as currently it seems relatively random. Tested out some of my ancient maps from 20 years ago. Working quite nicely apart from it really doesn't like 5D space like expected. Its also using the landscape as a normal texture. Thats on my list. 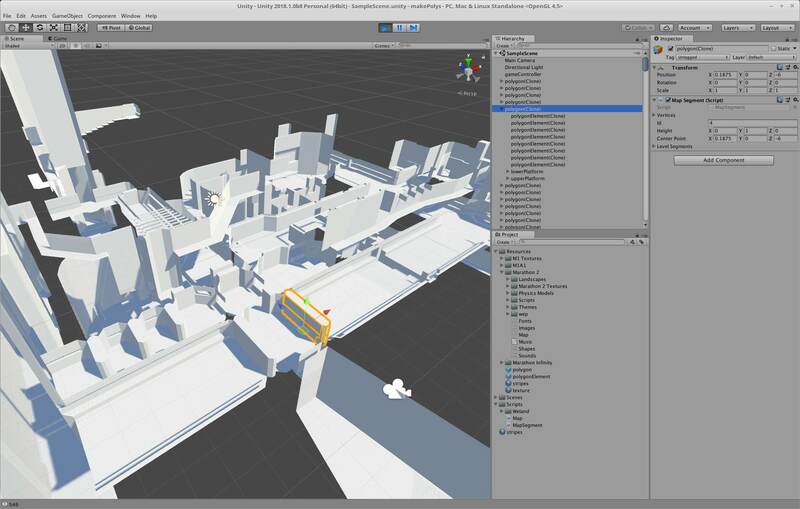 If i can ever get the platforms generating correctly - it turns out that there are a surprisingly large number of ways to abuse the collection of hacks that bungie decided to call a platform, and my idea to create an empty polygon and then have an actual platform object that goes up and down inside that is proving to be more complex to implement than i thought. Hopefully i can get that working tonight. Yes, the landscape textures are displayed as regular textures. and if i am not mistaken I also noticed some transparent textures simply displayed as blue (where it was supposed to be transparent) when I tested out the Marathon Eternal data files. What's your plan regarding lighting? Im not entirely sure. I think im going to have some sort of shadowmap that will be generated from the map data, that way it should look exactly like a marathon map but you can have point lights from weapons and explosions illuminate the scene as well. Further down the track, id like to look at getting rid of baked shadows and attaching lights to textures so that you can have the scene illuminated from where the lights are drawn on the screen. The lighting quite often doesnt make any sense in maps tho, so it will probably also need to have some sort of algorithm that looks at the lighting on the surfaces and spawns lights throughout the map to try to approximate the lighting in the map data. Yeah, the problem with lighting in maps is that it's relatively freeform and many mapping methods use lighting in a more "practical way" rather than realistic. Yeah, I might have a look at some of the doom source ports, IIRC some of them added fairly complex lighting so they would have run into similar problems. I dont think dooms lighting was as complex as marathons tho, so maybe their solutions wont quite work here. Especially with how to light 3d models added to the scene. I really like the idea of trying to infer the existence of point lights from surface lights, and then applying dynamic point lighting from those inferred lights.